The Miami Dolphins‘ first game of the season ended in stunning fashion on Sunday when Los Angeles Chargers kicker Younghoe Koo missed a 44-yard field goal, allowing the Dolphins to hang on to a 19-17 lead. 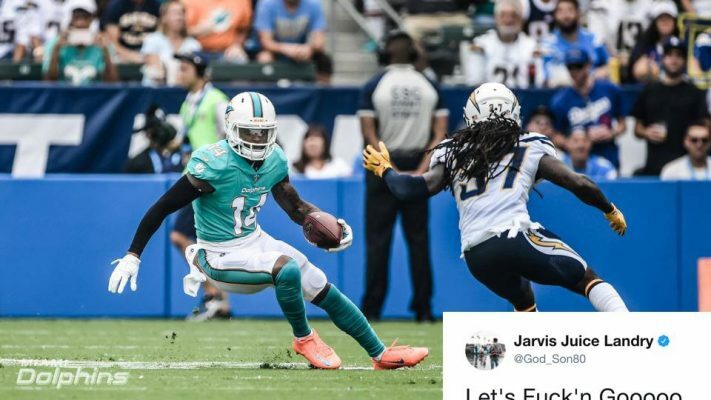 As the Miami faithful celebrated the victory, so too did Dolphins star receiver Jarvis Landry, who promptly took to Twitter to express his excitement following the game. It’s clear that quarterback Jay Cutler has already identified Landry as a security blanket on offense, as Landry led the team with 13 receptions for a total of 78 yards receiving. While the Dolphins were forced to wait one extra week to finally take the field, based on Landry’s reaction, the wait was well worth it. Jonathan is a freelance writer, filmmaker, and passionate fan of the NFL. In the past Jonathan has covered politics, entertainment, travel, and more. He is a proud contributor of Dolphin Nation.